Sir Henry (Christopher Lee): I can understand someone wanting to steal a pair of boots —  but one? So there it is. Sherlock Holmes (Peter Cushing): Do you imagine that I can prevent the Powers of Darkness? Sir Hugo Baskerville: Let the hounds of Hell take me if I can’t track her down! Doctor Richard Mortimer: But this is remarkable! Sherlock Holmes (Peter Cushing): Superficial. There is nothing remarkable about using one’s eyes. Sherlock Holmes (Peter Cushing): This is, I think, a two-pipe problem. Sherlock Holmes (Peter Cushing): I must insist upon one thing. Under no circumstances are you to go out onto the moors at night. Sherlock Holmes (Peter Cushing): Elementary, my dear Watson. Tarantulas are not from South Africa. Sherlock Holmes (Peter Cushing): I never relinquish a case! Stapleton: What do you expect to find down here, Mr. Holmes? Sherlock Holmes (Peter Cushing): What one expects to find under the ground. Bones, perhaps? Bishop Basil Frankland: Bishop of the Upper Isles — ¦ for what they’re worth. Sherlock Holmes (Peter Cushing): There is more evil around us here than I have ever encountered before. Sherlock Holmes (Peter Cushing): I warned him! What could have possessed him to come out here alone? Sherlock Holmes (Peter Cushing): We shall avenge his death, not mourn it. Sherlock Holmes (Peter Cushing): The depth a human being can sink to! Sherlock Holmes (Peter Cushing): In a case such as this, everyone is suspect —  even Sir Henry. Sherlock Holmes (Peter Cushing): The dagger’s gone! Don’t you realize what that means? Sir Henry is to die tonight! Cecile Stapleton: The Curse of the Hound is on you! 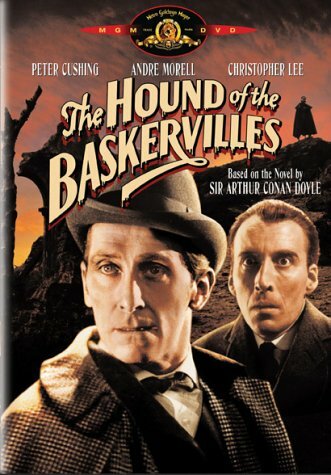 Sherlock Holmes (Peter Cushing): My professional charges are upon a fixed scale. I do not vary them, except when I remit them altogether. Sherlock Holmes (Peter Cushing): The powers of Evil can take many forms. Remember that, Sir Henry, when you’re at Baskerville Hall. Do as the legend tells and avoid the moor when the forces of darkness are exalted. Cecile Stapleton: When you’re poor, no one wants to know you. Sherlock Holmes (Peter Cushing): if you value your life. Sherlock Holmes (Peter Cushing): You had better be off. You mustn’t be late for your peasant friends — ¦ I hope you enjoy their rabbit pie. Sherlock Holmes (Peter Cushing): Muffin? Doctor John Watson (AndrÃ© Morell): Thank you. The first Sherlock Holmes movie to be filmed in color. Christopher Lee readily admits he has a morbid fear of spiders, and the panic on his face during the scene with the tarantula is not due to acting. For his role as Sherlock Holmes he of course had to have a pipe but as Peter Cushing didn’t like the taste of the pipe, he kept a glass of milk always to hand to remove the taste. The Baskerville Hall set is a redress of that used for Castle Dracula in Horror of Dracula (1958), in which Christopher Lee and Peter Cushing also starred. The hound they used was a real dog called Colonel. On the set before the hound attacks Christopher Lee’s character Sir Henry Baskerville, they could not get Colonel to jump on Lee, so they started to — prod’ him into action. Lee gave up and suddenly, Colonel lunged on him and bit right through one of his arms. AndrÃ© Morell was one of the first film portrayals to show him as a more than competent colleague of Holmes, rather than the lovable buffoon that Nigel Bruce had portrayed.